The Martin Sec Valle d'Aosta pear, is a natural product from the italian traditional agricolture. 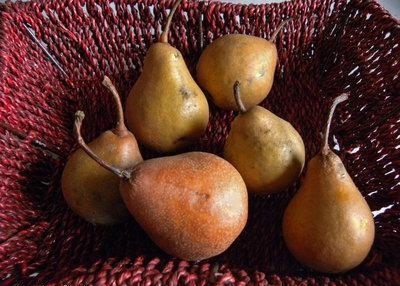 It is a small, rough skin and grainy rust-colored pulp pear, typical of the Valle d'Aosta region. Its peculiarity is to be a very little juicy pear, but, at the same time, very aromatic and with a fragrant aroma. This fruit of the italian agricultural tradition is mainly consumed in syrup; if cooked in wine, it turns red as its skin and conquers a particular softness that makes this pear really unique. However, it is recommended to spend at least 20-30 days from its collection if you just want to taste it raw. It's marketing in the Valle d'Aosta region is mostly entrusted to the Cofruits, the agricultural cooperative of Saint-Pierre, that has launched a line of products based on the Martin Sec pear, such as jams and juices. Very particular is also the Martin Sec pear based liquor, widely used especially during summer for its fresh taste and available from local producers.